Joyce (aka Jay) Jardine with copies of her charity fundraising book, Out of Eden. 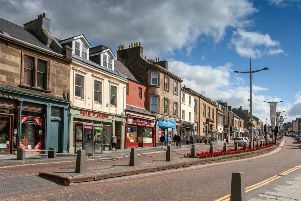 Folk who come to live in Lanark do so in many and varied ways, and for just as many different reasons; for work, marriage, or even just a desire for a rural lifestyle. However, perhaps the most unique journey ever to the Royal Burgh was taken by a family driven from their homeland by persecution, only to find more prejudice awaiting them when they reached their ‘haven’ in post-war Lanark. Book launch...friends Evelyn Brown (left) and Gaynor Halley enjoy the book launch. A member of the weel-kent Mulvaney family, Joyce Jardine has written a book to tell the full story of her clan’s sojourn from an almost luxurious lifestyle as an Anglo-Indian family living in what was virtually a small palace called Eden to a council house in Lanark. You couldn’t find a place so different from Lanark than India in the dying days of the British Raj. This is not the place to point fingers of blame for how Britain’s departure from the sub-continent after 300 years was so badly botched that it caused the violent deaths of an estimated one million Indians and citizens of the then new nation of Pakistan. However, although Joyce’s mum and dad, Anglo-Indian Kathleen and Indian-born Brit Bill, escaped the blood-letting, they quickly realised after Indian independence that they were no longer welcome in the land of their birth. They were caught in the ridiculous situation of seeming too British for the Indians and, when they fled to Lanark, seeming too Indian to be British! When the Mulvaneys left their beloved Eden, they came to Scotland with virtually nothing; the family were not even to see the final proceeds of the sale of Eden for 40 years and a miserly Indian government allowed them to take the grand total of £15 out of the country. At the time, the couple had three boys – Patrick, Michael and Leith. Joyce, who was born after the family’s arrival here, pulls no punches when relating how Lanark’s first Anglo-Asian family were greeted. There are passages in the book that make harrowing reading; the Lanark High Street greengrocer who always claimed to have run out of fruit when Kathleen shopped there; the massacre of Joyce’s baby rabbits in the hutch outside the family home in Melvinhall Road; the grafitti saying “Darkies Go Home” daubed on their shed. But by that time, the Mulvaneys realised that ‘home’ was now Lanark – and no-one was going to drive them out. Their beloved Eden had gone forever and they decided to make the best of their now riches-to-rags existence. The Mulvaney brothers won a reputation for being tough lads at school in the town in the 1950s and 60s but Joyce makes it clear that this was not by choice; it was the only way they could survive the racial taunts and attacks. Throughout the book Joyce somehow manages to temper her tales of prejudice and setbacks with humour. As a young girl visiting Lesmahagow a thug attacked her the second she got off the bus from Lanark. Years later, while at a pop concert at the Memorial Hall, who should come up and ask her to dance than the self-same ned! He didn’t recognise Joyce – who inherited her mum’s striking looks – as the wee girl he’d racially abused and assaulted all that time ago. She managed to lure him back to the Mulvaney house in Melvinhall Road where two of her brothers made their displeasure very clear! Although the loss of the family home in India – the book is entitled Out of Eden – is a recurring theme in the book, its true hero is Joyce’s mum Kathleen. While she had Indian teaching qualifications, the old Lanarkshire County Council could only offer her a job as a school cleaner. Perhaps it was just as well for our area; we would have lost the services of a compassionate woman who was simply born to nurse. After qualifying, she served at Law and Bellefield Hospitals before becoming Matron of the Monteith House Nursing Home. With cruel irony, she was destined to spend her final years in Monteith after a catastrophic accident. She died in 1994 and, as is so common with truly loving couples, her husband Bill passed away within a year. Bill played an invaluable role in health care too, using organisational skills learned in the wartime army to become operating theatre organiser at Law Hospital. The book costs £7.99 with all proceeds going to charity. It is available from Joyce on 07765 245832 or 01555 661099 or from John Tariq’s Londis shop in Lanark. The author of Out of Eden was christened after an aunt who, along with her children, lost her life in what remains the most mysterious air disaster in north American aviation history. When the family were forced to leave India, they scattered to the four corners of the earth. Many went to Australia while the Mulvaney branch of the clan headed for Scotland. One of Kathleen’s sisters, Joyce, had fallen in love with and married a Royal Canadian Air Force radio operator stationed in India during the war. Post-war they settled in Alaska where he was now serving in the US Air Force. In 1950 Joyce, along with their 20 month old son Victor, boarded an airforce transport plane so that she could have what would have been their second child in a big city maternity hospital. The plane they were on, along with 42 other passengers and crew, disappeared without trace somewhere in the Alaskan/Yukon wilderness. What followed was the biggest search and rescue mission in north American history, with scores of aircraft and military personnel thrown into a frantic operation to locate the wreck and get any survivors to safety before they froze to death in one of the world’s most inhospitable regions. But no trace of the crashed aircraft – or Joyce and wee Victor – was ever found. It remains the most serious air crash on land in north American history where no trace whatsoever was found of either a wreck or remains. Years later ‘our’ Joyce’s mother told her how the tragedy had a colossal effect on the mental health of the widower who was obessed for years by the mystery and made repeated calls for the search to be resumed. He never got over the tragedy and remained convinced his lost loved ones were still alive somewhere out in the snow and ice of that terrible wilderness.